Walla Walla’s roller-coaster women’s basketball season continued Wednesday night in the Dietrich Dome, and not in a good way as far as the Warriors are concerned. Exactly one week after their most impressive win of the season, a 95-91 overtime victory over Eastern Region-leading Wenatchee, the Warriors stubbed their toe Wednesday against Spokane and suffered a 77-65 defeat. 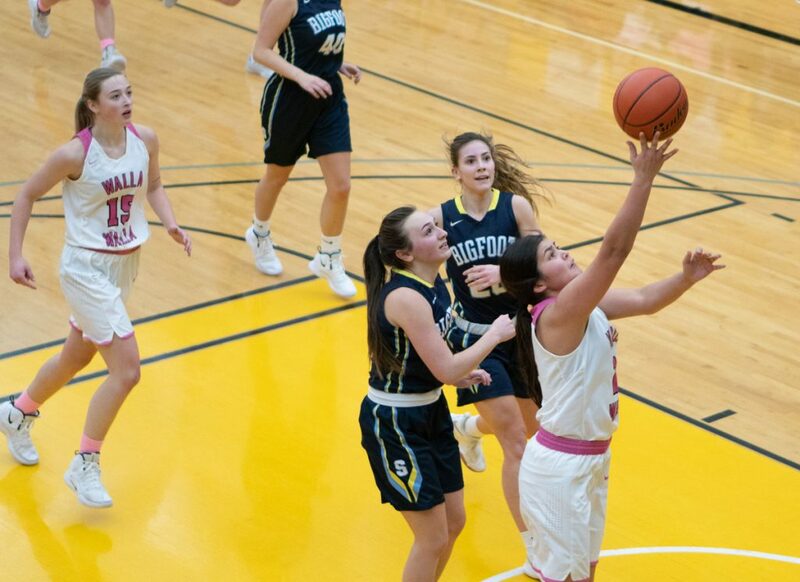 Coupled with Saturday’s 87-86 loss at Yakima, also an overtime affair, WWCC has now lost two straight games for the second time since league play began Jan. 2. The Warriors also have a pair of two-game winning streaks during league play, and their 6-5 East record is still good for fourth place in the region. Inconsistent shooting has been WWCC’s downfall in most of its losses, Hazeltine suggested. The Warriors hit just 38 percent of their shots from the field overall Wednesday against the Sasquatch, and they were a disappointing 4-for-15 (27 percent) from 3-point distance. “We just never really got anything going,” Hazeltine said. “We are just so inconsistent, and you are not going to win many games playing like that. Guards McKenzie Gunter, Jessica Cheney and Sailor Liefke were a combined 15-for-45 from the field overall and 4-for-14 from outside the 3-point arc. Gunter led the Warriors in scoring with 17 points, Cheney tallied 15 and Liefke finished with eight. Freshman post Holly Golenor was also in double figures with 10 points on 5-for-8 shooting, and she and Liefke hauled down nine rebounds each. Shania Graham led a trio of Spokane players in double figures with 22 points. Koyama Young put in 13 and Jessica Olson tallied 10 points and picked off a team-best six rebounds. The Sasquatch shot 42 percent from the field overall and an even 50 percent (13-for-26) from downtown. The Warriors, 16-8 on the season, are still step ahead of Spokane (5-6, 16-7) and Yakima (5-6, 14-9) in the East Region standings and a half a step behind third-place North Idaho (6-4, 16-6). The Cardinals invade the Dietrich Dome Saturday afternoon.